It has been cars, cars, cars all weekend. 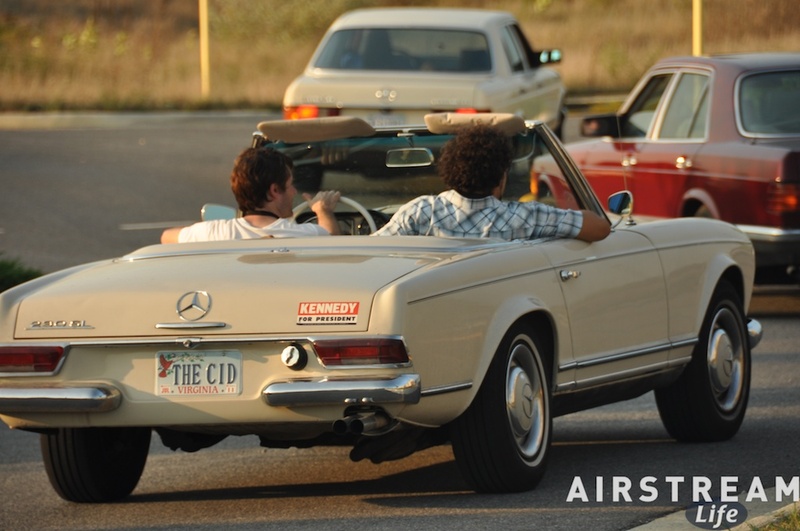 We’ve been attending StarFest 2010 in Winchester VA, which is the annual national event of the Mercedes Benz Club of America. It’s quite different from the Airstream events we normally attend. Obviously the attendees stay in a hotel rather than in their vehicles. But beyond that, the emphasis is different. 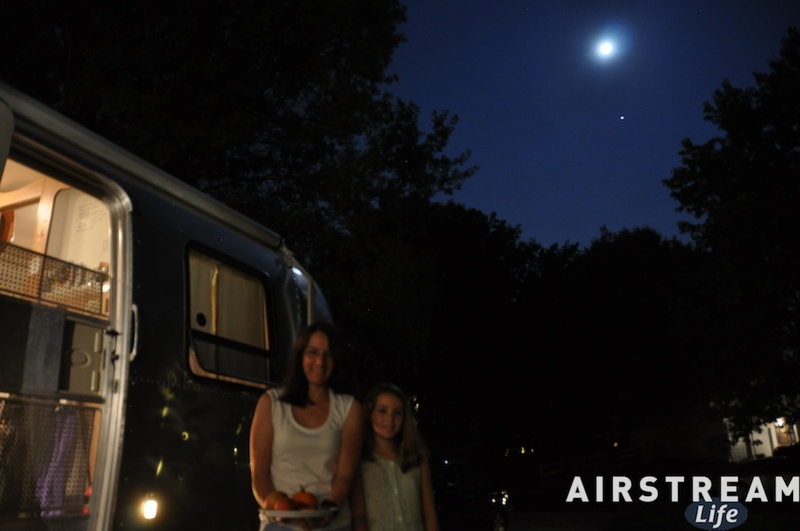 Airstreamers tend to focus more on the community of people than the trailers. This crowd is interested in the cars more than anything else: driving them, maintaining them, showing them, and talking about them — especially the exotic, rare, or old models, like the award-winning red 300SL pictured at right. There was some passing interest in the Airstream, but mostly it was regarded as an amusing curiosity, and again the attention was mostly paid to the GL320 that towed it. At the Concours Award Banquet on Saturday night, I was interrogated by my fellow table-mates about its performance. They appeared to be suitably impressed. As with the Airstreamers, the crowd was mostly older, but there was a small contingent of young guys who all operated independent shops specializing in 1960-1993 (approx). 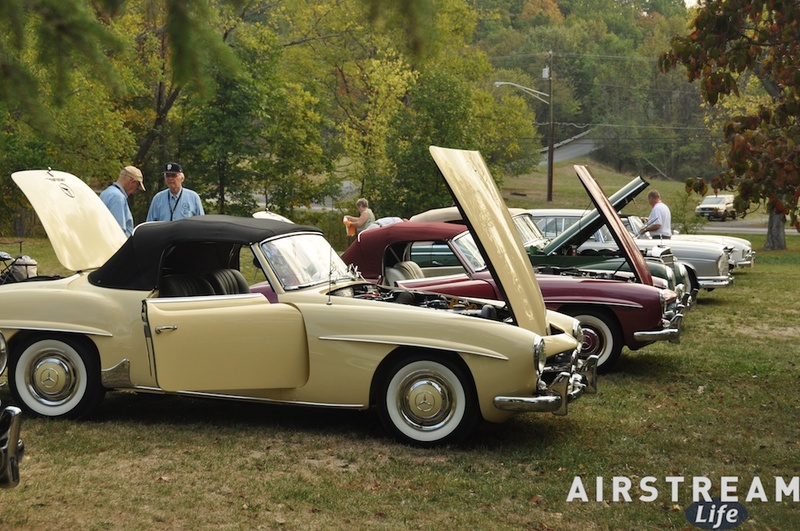 Mercedes cars — the “affordable classics.” You can still easily find a lot of great old Mercedes cars in good operating condition (cosmetically imperfect) for very reasonable prices, and guys like these will help you keep them on the road forever. I went to a talk given by representatives of the MB Classic Center, and they emphasized that Mercedes intends to keep producing parts to keep old cars on the road, safe and reliable, for decades to come. There were other interesting talks that I attended (and I got a few ideas for next year’s Alumapalooza, too!) But the big event of Saturday was the Concours show, where we had excellent examples of Mercedes vehicles from seven decades. On Sunday, we dropped in on the Autocross for the morning and watched some of the hotter cars zip around a complex and tight little course. We did the Defensive Driving course again, just for practice. Wondering why there’s a Smart car in the picture at right? It’s a Daimler product and some Mercedes enthusiasts own them. It’s not for me, but they are awfully cute and I bet this one would have done well on the Autocross if the owner was willing to give it try. I was pleasantly surprised by Winchester. The “historic downtown” (a phrase horribly abused by some local chambers of commerce) is truly historic. There’s a ton of great Colonial architecture remaining in town, centered on a handsome and vibrant brick pedestrian mall. The city reportedly changed hands 71 times during the Civil War, and the Court House held both northern and southern prisoners. You can still see their graffitti on the interior walls of the building, upstairs. While a few buildings are in obvious distress, the majority of the downtown is well restored and housing robust businesses. 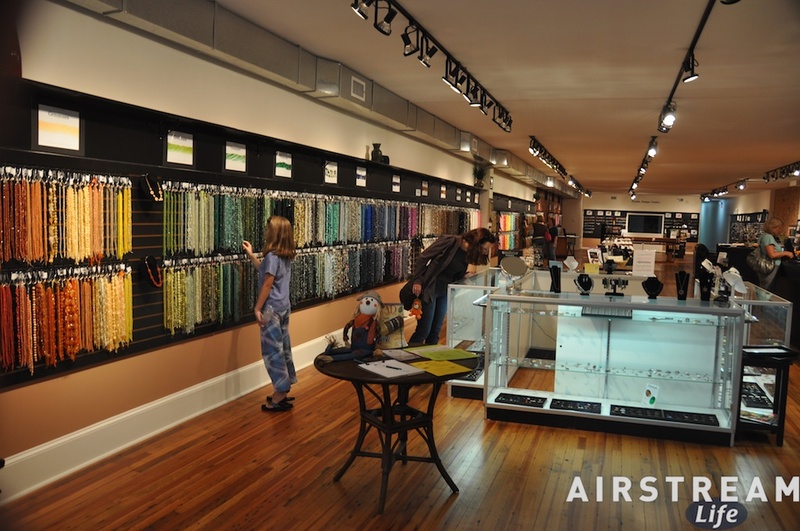 Eleanor and Emma were intrigued by the bead shop, while I was astonished to find an independent old-fashioned third-generation clothing store, the kind you never see in downtowns anymore. The architecture is spectacular, with historic brick buildings, stone buildings, and even a log building. Winchester’s center has a lot going for it. 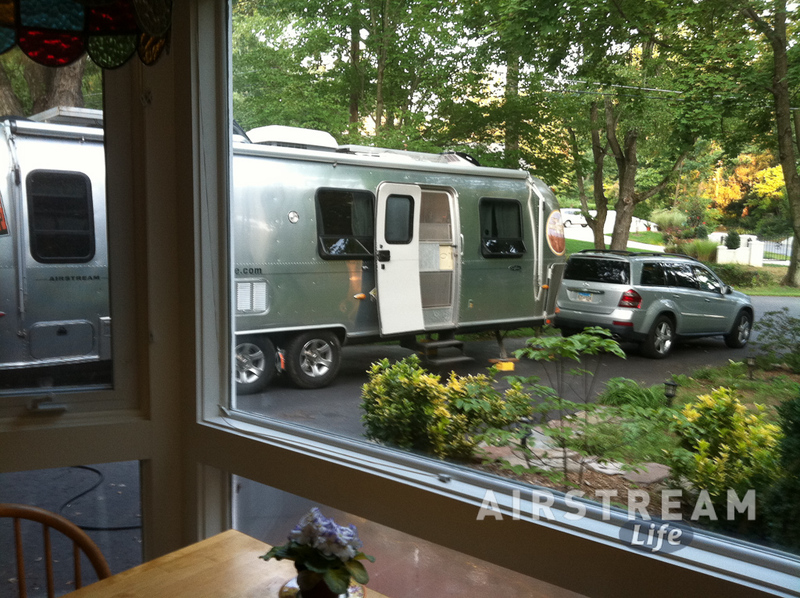 We have now relocated the Airstream to Falls Church VA, where E&E are courtesy parking with Bobby, Danine, and Elise. We first stayed with them in 2007, then they stayed with us in Tucson in February 2008, and now it’s our turn again in 2010. But I am up in northern New Jersey for an overnight, doing some business, so I’m once again in a hotel. I’ll rejoin the group on Tuesday night and we’ll get back to the serious business of Airstreaming. We had intended our courtesy parking stop in Columbia MD to be a very relaxing time. An old friend and co-worker let us block most of her driveway with the Airstream, so we had a nice spot in a suburban neighborhood with an electric cord running into the garage for three nights. But it wasn’t very relaxing after the first night, when Eleanor made dinner for everyone. The next day things got away from me (work-wise) and I ended up running back and forth to the local Fedex Kinko’s and worrying about mail that was supposed to have arrived but didn’t. The next day we had a series of frustrations, culminating in a really terrible haircut for me (I now look as if I’ve recently had chemotherapy), my glasses spontaneously breaking, and Emma losing her beloved Kindle. So most of our visit was not particularly relaxing, but at least we were in a place where we could deal with it. Time will fix the bad hair, and large quantities of money will eventually fix the glasses and Kindle. We’ll live. Our hosts had their own hassles too, so there was plenty of commiserating going on. On our last night Eleanor and Emma did their usual Moon Festival stuff, which includes making “moon water” and putting a tray of round things out under the full moon. Note the very bright planet of Jupiter shining just below the Harvest Moon, visible even near major urban lights. On the short 95-mile trip from Columbia to Winchester, we paused at Harper’s Ferry National Historic Park just to check out the situation. We knew we didn’t have time for a proper visit, and once we got to the Visitor Center we realized that even a cursory visit would take hours. The park is gigantic, spread across nearby lands and towns. You take a shuttle bus from the Visitor Center to various locales, each of which takes anywhere from one to six hours to explore. This looks like a really great park for a fall visit some year, and I am sure we will eventually be back, but this just wasn’t our chance. Not only was the heat and humidity reaching oppressive levels (this late in September!) but we have — alas — a schedule to keep. At least our visit gave us the chance to replace our expired “America The Beautiful” Inter-agency Pass (good for national parks, forests, and other public lands). There’s not a lot of camping in the area, except for the super-deluxe KOA that is conveniently next door. It’s not cheap but it does look very good. We dropped in to use the dump station ($5) and refill our water, then pressed on to Winchester VA, where we will spend the next three days attending the Mercedes-Benz Club of America’s “StarFest 2010”. It’s sort of like the WBCCI International Rally, but for Mercedes enthusiasts. Of course, not having rolling homes with them, the Mercedes crowd books into a hotel. After pondering our options for a while, we have decided to join them for a change. 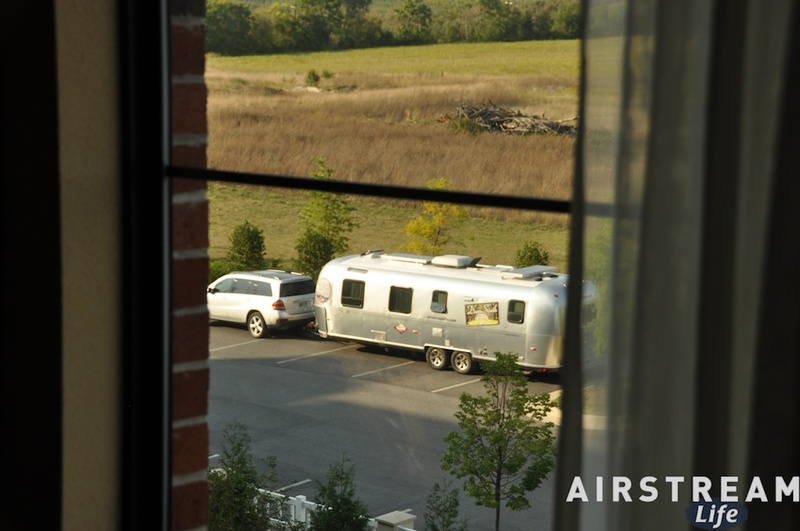 So the Airstream is parked in the back of the hotel where we can see it from our room, taking up six parking spaces. We have converted the hotel room into a sort of quasi-Airstream by requesting a microwave and hauling in food, clothes, computers, etc. — in other words, we’re trying to make a hotel room as comfortable as our Airstream. It’s a tall order. There’s really nothing as convenient as having your home behind you, your own food in the fridge, complete cooking & bathing facilities, no need to pack and unpack, etc., but you knew that already. Our itinerary has brought us past the NY/NJ metro area and down to eastern Pennsylvania for the weekend. Eleanor and I felt that Emma was at an age where she could stand to learn a bit more about how and where this country came to be, so we booked the weekend at French Creek State Park, in Elvorson PA. It’s about 45 miles from central Philadelphia, an easy one-hour drive down Rt 422 and I-76. 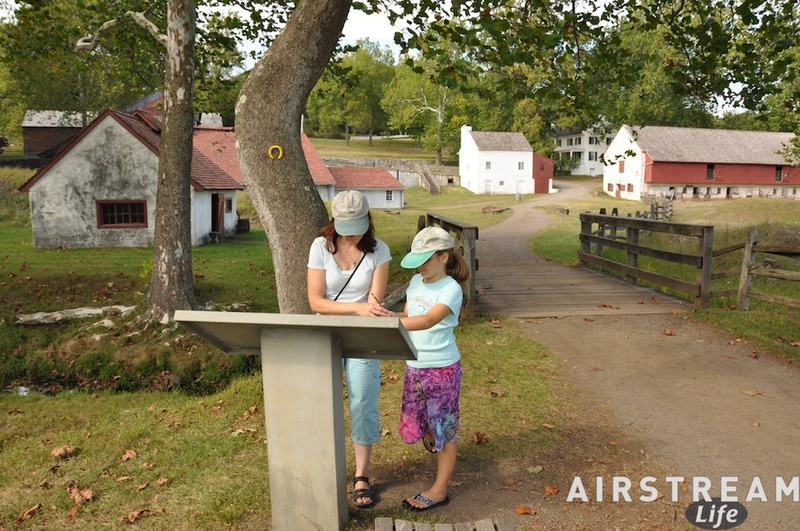 Our intent was to drag Emma through a lot of historical sites and try to interpret early American history in a way that would keep her 10-year-old mind attentive. That’s quite a challenge when the competition is dragon tales and talking owls. She’d much rather be reading her Kindle. 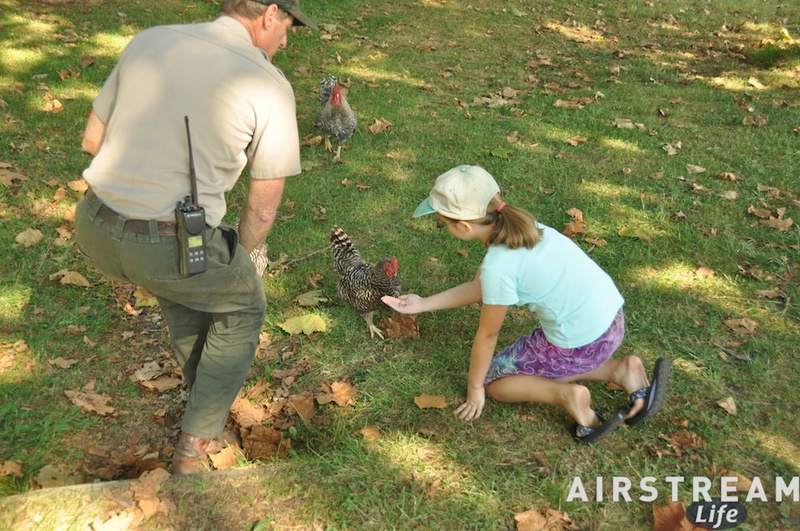 The weather is beautiful here, and that has caused the state park staff to open up a previously-closed loop of the campground. The park is full, which is nice but not surprising. As I’ve noted before, state parks have been very busy since the recession began a couple of years ago, and it’s good to see that some states have the sense to continue running their parks for the benefit of the people. But although we’d rather stay in a state park that almost any other place, it does get a little tiresome with the campfire smoke. I like a campfire as much as the next guy, but maybe lessons should be given to people who don’t know how to make them. We’re always surrounded by people who can only make smoke, and no flame. As a result, the entire campground — all four loops — and much of the surrounding area is completely engulfed in smoke. It’s like camping in the middle of a major wildfire. Last night when we came back from a day in Philadelphia, we were still a mile from the campground turnoff when we drove into the wall of smoke. It was thick enough to look like fog in the car’s headlights. One or two of the fires in the camping loop was actually a fire, but our neighbors were busily tending what appeared to be an attempt at smoke signals. They’ve been feverishly carting wood from their van (apparently half a cord, from the looks of it) and adding it to the heap like squirrels collecting nuts before winter. Twenty-four hours a day they tend the smoldering pile, as it their lives depended on it. And so, smoke fills the campground day and night, morning and evening. There is no escape, except to leave the park entirely. Fortunately, we spent Saturday in Philadelphia. I can report that the birthplace of American independence is alive and well. The picture at left is a little complicated, but it shows three levels of activity all happening outside the national park building that houses the Liberty Bell. Crossing from right to left you can see a line of tourists fresh off the bus, each wearing a badge to identify them as people who paid to ride a bus to Philadelphia. They are going to get in the very long line you see at left (background), which winds along the side of the building and around the corner. If you stand in this line for about 40 minutes, you can see the Liberty Bell up close. There is no charge, except for the loss of your time. Or, you can walk another 50 feet to a window and see the Liberty Bell from a distance of about 20 feet with no wait at all. Your choice. 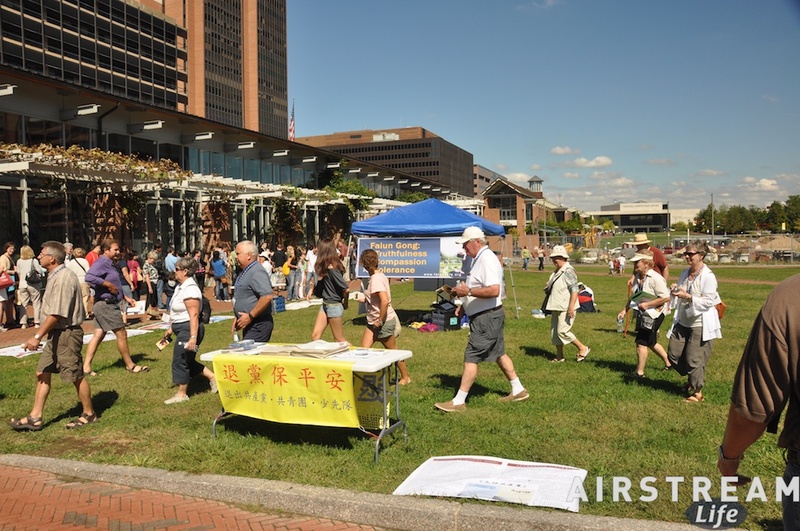 In the middle of the photo, the Falun Gong are very peacefully exhibiting graphic photos of the abuses they’ve suffered at the hands of the Chinese government. Three of them (not visible) are sitting on the grass, in a meditative position with a hand held vertically below their face, as if praying with one hand. I’m sure they appreciate the symbology of demonstrating for their religious freedom in the birthplace of American liberty. Having been to all of the major historical sites in Philadelphia before, we decided to skip the most crowded ones and instead give Emma a light-weight version of the birth of American independence from the street. Our version is rather like a novel, with the oppressive King George and his army, the brave George Washington, the clever Ben Franklin, epic battles and setbacks, the risk of failure (“We must hang together or we shall certainly hang separately”), and finally (when things looked grimmest) the unexpected rout by the underdogs to achieve a lasting freedom. For good measure we threw in some gory anecdotes like “how to use a bayonet,” and a short lecture on the importance of symbolism (such as the Liberty Bell). 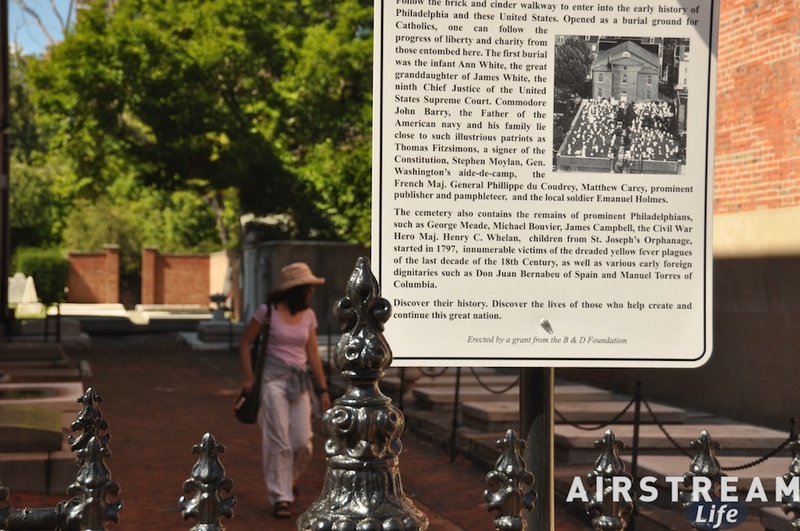 Philadelphia is of course loaded with interesting historic cemeteries. Despite our efforts, we had already lost Emma’s interest back in the Independence National Historic Park visitor center, so we figured we might as well try to kill her with boring history by browsing past mausoleums and grave stones. If she died of boredom, at least we would not have to tote her far. Amazingly, she survived this because she actually likes gravestone art. As far as Emma was concerned, there was one reason to come to Philadelphia, and that was the famous Philadelphia cheesesteak. Legend tells that Jim’s on Summer Street is the best cheesesteak in Philadelphia, but of course on a gorgeous Saturday in September the line was out the door and around the corner. We decided to try an alternate restaurant, and settled on Steve’s, just a few blocks down. Jim’s has been making cheesesteaks since 1929, and Steve’s sign proudly proclaims “Since 2003” but he seems to have figured it out because the end result was just fine. 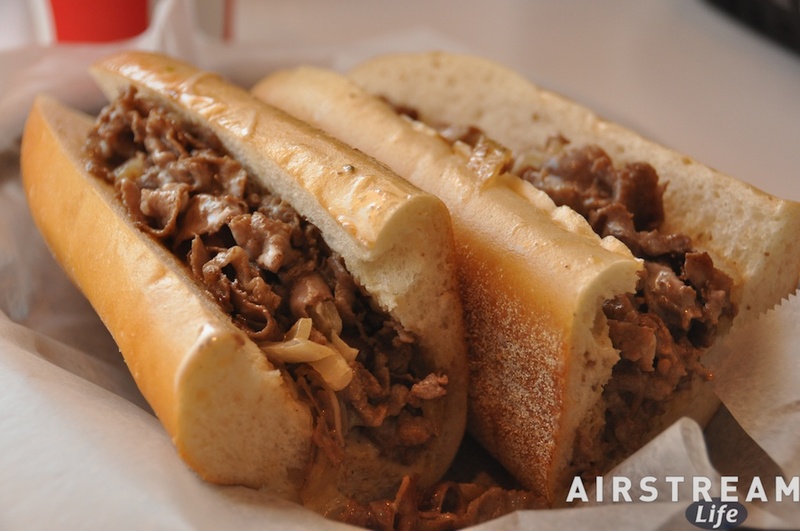 A cheesesteak isn’t remotely health food; it needs to be glistening with melted cheese and a fair bit of grease in order to taste right. There ain’t no whole wheat bread or “lo-cal” options, either. Toss in a Barq’s root beer and you’ve got a combo that will simultaneously satisfy and fill you with guilty pleasure. It’s simple and direct: fat and sugar makes the brain happy. There were no leftovers. But after that we did feel the need to do some more walking. If we’d sat too long, I think we might have become semi-conscious. Emma, having had her pinnacle moment, resumed grumbling about the boredom of street hiking and looking at architecture. (She’s practicing to become a teenager, you see.) Eleanor and I, practicing to become hardened parents of a teenager, resumed our process of humorizing and/or ignoring her attempts at pathos. We all felt good about our efforts. 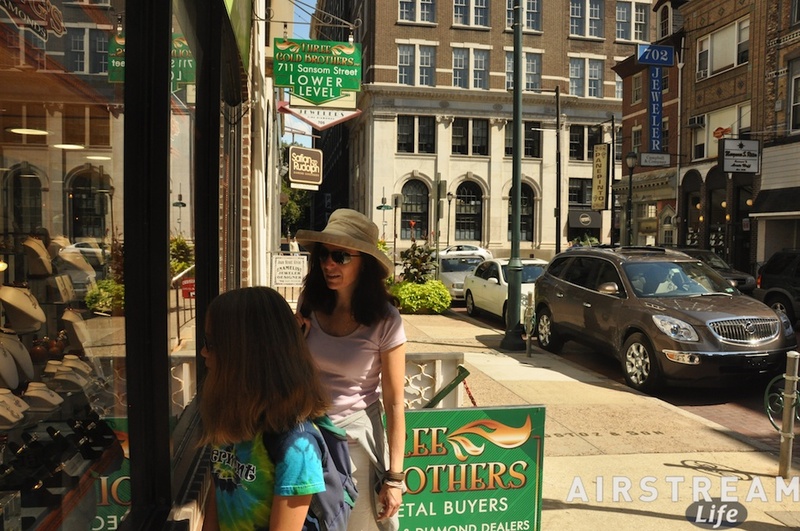 Jeweler’s Row was next. This was an error on my part, for obvious reasons. If I’d known, I would have picked another route. Fortunately, many of the shops appeared to be run by Orthodox Jews who were closed on Saturday. I was ultimately only obliged to enter one store (run by Chinese) and while Eleanor loved the ring it was predictably not in our budget. Still, I was a bit spooked by Emma’s interest in looking at jewelry through the windows, and her comment, “I’m glad I’m going to be a wife and not a husband, so I get jewelry and don’t have to buy it.” Where did that come from? For Eleanor, if there was one place we had to visit while in Philadelphia, it was Reading Terminal Market. We always visit the big city food markets when we can (such as Cleveland’s West Side Market, three years ago), because that’s where Eleanor gets ideas and rare ingredients. Reading Terminal Market is housed in a former train station next to the convention center. Its present incarnation began about 30 years ago, when Amish farmers were invited to vend in what was then a seedy neighborhood known primarily for X-rated theaters and dive bars. Amazingly, they came and gradually turned Reading Terminal Market into a major phenomenon. 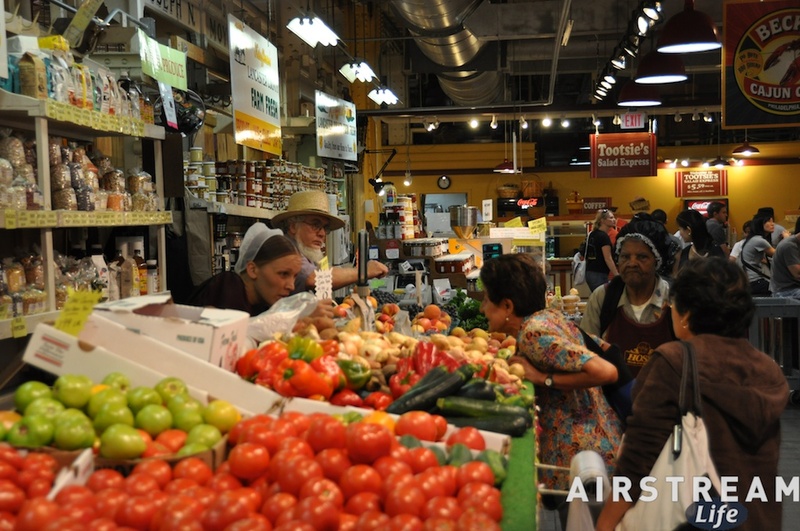 The Amish are still the backbone of Reading Terminal Market today. It’s not just fruits and vegetables, though. The famous local L.D. Bassett ice cream has been here for many years, along with vendors of beeswax candles, meats & cheeses, coffee, fish, baked goods, and much more. You can really spend a lot of time (and money) here if you care to browse, and there’s a little room to eat on-site. We were there for about two hours, until closing. Eleanor came away a relatively light load because she didn’t want to get a lot of perishables: five different cheeses, and some Chinese eggplant for Monday’s dinner. While walking around, she tried green tea infused with pineapple (not bad) and Emma and I split a dark chocolate milkshake at Bassett’s. 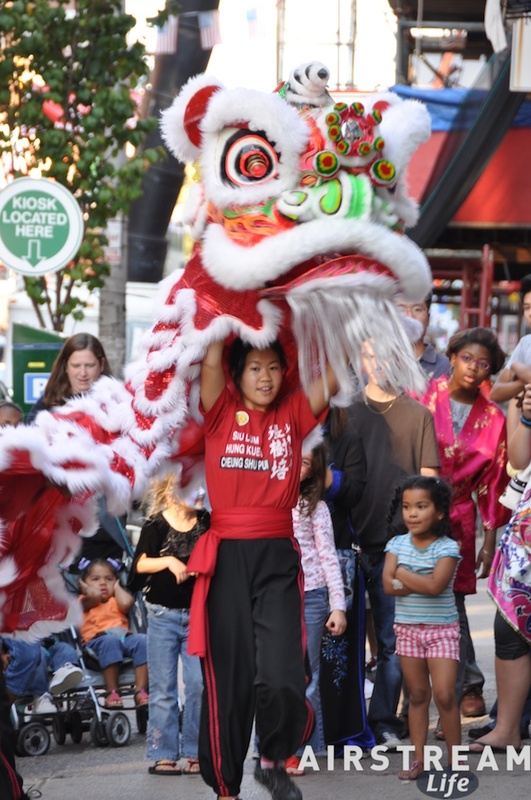 The final stop of our city tour was Chinatown, where along Race Street a celebration of the Autumn Moon was going on. We had thought it was later this week, so this was a nice bonus. Eleanor and Emma usually like to make Moon Cakes but since were there, Eleanor decided to buy some instead. And of course since she was in the Chinese pastry shop, she picked up a few other things: a cream-filled coconut bun, a raisin bun, red bean cake, lotus bean cake, and a coconut tart. We ate the coconut bun right on the street—fantastic—while watching celebratory dragons on the street (video). The raisin bun was gone a few minutes after we got back to the Airstream. I think it’s fitting, that as the birthplace of this country, Philadelphia is so ethnically diverse. It’s a good reminder that while we started as a breakaway British colony, this country was founded on the principle that All Men Are Created Equal … and “are endowed by their Creator with certain unalienable Rights …” regardless of religion or where you might have come from originally. Life, Liberty and the pursuit of Happiness were rights well-exercised this Saturday in Philadelphia.